Jim Kelly, ARES Chief Executive Officer, has over 38 years of electrical utility experience. The former Senior Vice President of Transmission and Distribution for Southern California Edison, Jim was one of the early pioneers of the Smart Grid and led advancements in grid sensing, monitoring and control. As more and more renewable energy resources come online, the transmission grid must adapt to increasing fluctuations in generation. Ancillary services enable transmission system operators to adjust the flow of electricity and “smooth” or regulate voltage on the grid. ARES’ fast response technology bridges the power gap between smaller battery and flywheel installations and far larger pumped-storage hydro – at a lower life-cycle cost than batteries, a higher energy-to-power ratio than flywheels, and a greater efficiency and faster ramp-rate than pumped-storage. 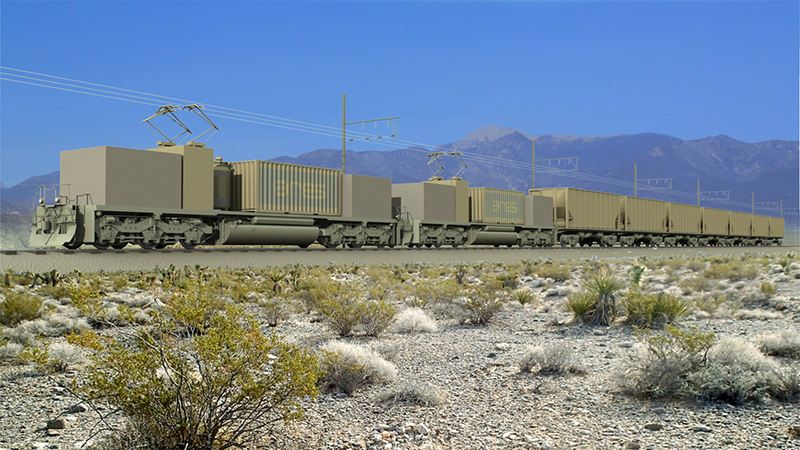 ARES’ technology uses electricity when it is abundant to power locomotives uphill. When electricity is scarce, the locomotives descend and their motors act as generators to return electricity to the grid. 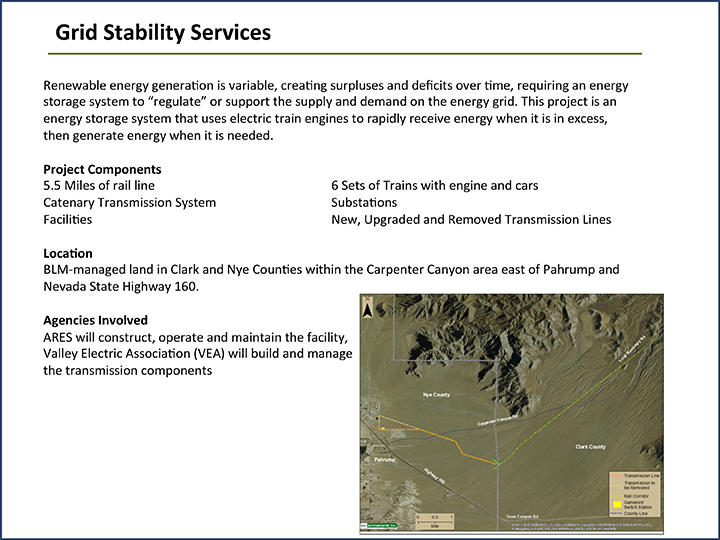 ARES proposes to locate a first-of-its-kind 50 megawatt [MW], grid-scale ancillary services facility in the Carpenter Canyon area east of Pahrump, in Nye and Clark Counties, Nevada. The ARES REM project will provide 12.5 megawatt-hours [MWh] of fast response energy to assist the balancing of intermittent renewable energy [solar and wind] connected to the regional transmission grid, increasing renewable energy penetration while maintaining grid reliability. In partnership with Valley Electric Association [VE], the project would access the regional electrical grid through VEA owned and operated transmission facilities and receive and respond to commands from the regional transmission grid operative, California Independent System Operator [CAISO]. Rail Corridor [Clark and Nye Counties]: The corridor would include the rail line, an access road, a parallel overhead power distribution line, a short spur rail to be used as a mid-elevation turnout, and drainage management features. Rail Vehicles: Shuttle trains, each comprised of two electric locomotives and multiple weighted cars, will ascent and descend the rail line at slow speeds to either take electricity off the grid [ascend] or supply electricity to the grid [descend]. 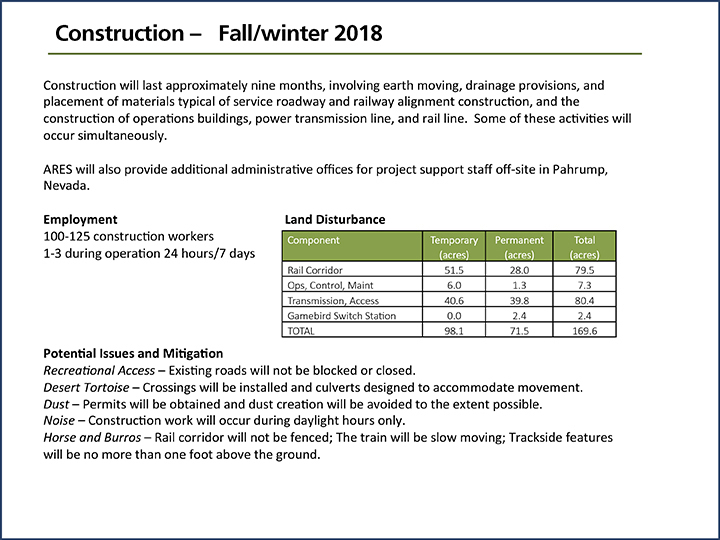 Operations, Control and Maintenance Facility [Nye County]: Rail operations would be supported with a project operations and control facility, a maintenance facility with spur rail, and a substation. The control facilities will respond to grid requirements by controlling the speed and number of shuttles in motion. A remote monitoring system would be installed a the facility to enable around the clock monitoring of the rail line. Additional support facilities would be located in Pahrump, Nevada. • A new substation adjacent to the ARES operation, control and maintenance facility. • A new .75 mile transmission interconnection line installed and operated by VEA to connect the substation to an existing 230 kV transmission line. • An upgrade of the existing 230 kV transmission line. The facility would be staffed around the clock for the duration of the BLM lease. Weekday day shifts would be staffed by 5 personnel including a control/operator, a security office, a general manager, maintenance workers and an administrative staff worker. Other shifts may be staffed by 3 personnel including a control/operator and a security officer. ARES is committed to utilizing local suppliers and works as much as possible for construction and operation of the project. ARES’ rail based energy storage systems are covered by one or more of the following US patents: 8593012, 8674541 with foreign patents pending and issued, making the project of interest world-wide. • Estimated project cost: $55 Million. • Operations: 16 FTE for 30 to 40 years. • Estimated aggregated economic benefit to the area: $100 Million. • Clean decommissioning process with no lasting impacts to the natural environment. 1In the California market place, ancillary services are referred to as Regulation Energy Management.